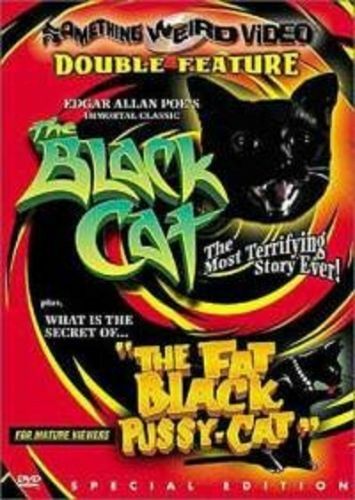 Harold Hoffman directed this Dallas-made oddity about a man named Lew (Robert Frost) who receives a black cat from his wife Diana (Robyn Baker) on their anniversary. Lew hates his father and thinks the cat is a reincarnation of the old man, so he gets drunk and gouges out its eye. Later, obsessed with the idea, he kills the cat and then his house burns down, driving him insane. Lew eventually gets out of the asylum and brings home a black cat, which also has a bad eye, then begins suffering from nightmares, imagining that his cat (or father) is haunting him. He tries to kill it, but the hexed lunatic kills his wife instead, walling her up in the basement as per the Edgar Allan Poe story. Lew's maid Lillith (Sadie French) calls the police, who are led to Diana's body by the meowing cat. Lew tries to make his getaway, which is foiled in a clever twist ending. Quite gory for its time, this black-and-white regional horror from Texas includes eye-gougings and ax murders, as well as a consistently bizarre tone which should please genre fans.